A flower or bloom is the reproductive part of a plant that has the ability to capture our attention and hypnotize us with its beauty, form and color. Besides just the apparent petals, every flower is comprised of many different parts that help in pollination, reproduction and other important functions. Flowers that comprise both male and female parts are called perfect flowers, while those with either one of the two are called imperfect flowers. Petals are the outer, brightly colored and sometimes aromatic parts of a flower. They are soft to touch and their primary function is to attract bees and birds that transfer pollen grains from the male to the female parts. Petals protect the inner delicate parts of a flower from natural elements including sunlight, winds, rain and snow. Located on the outer and slightly lower part of the flower, the sepal resembles green petals that surround the developing bud. It protects the bud while it develops and matures, thus minimizing the chances of the flower dying due to natural elements such as rain and winds. The male reproductive part of a flower is the stamen, which produces pollen. It is made up of two parts--antler and filament. The antler is usually yellow and features a tiny round sac that produces pollen. It rests atop a thin, delicate and long stem called the filament. 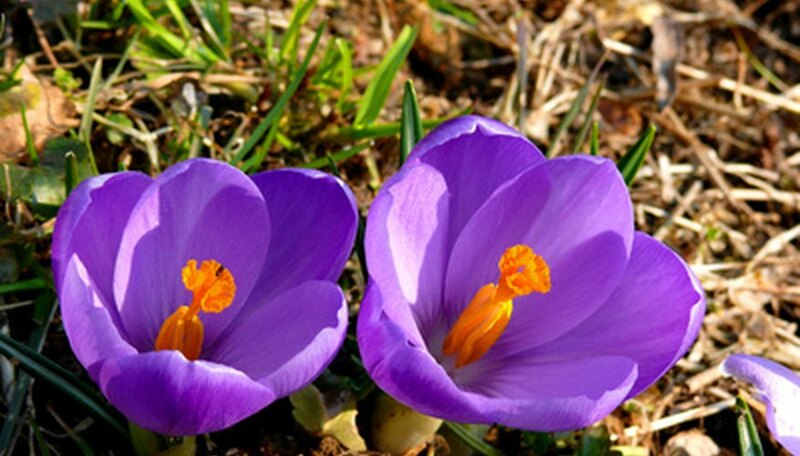 Most flowers are comprised of the same numbers of stamens and petals. Most flowers feature the female reproductive part, called the pistil, in the center. The pistil is comprised of a stigma, style and ovary. The upper part of the pistil that catches and traps pollen is called the stigma. It naturally features a sticky bulb to which pollen grains attach. The style is a tubelike structure that holds and supports the stigma. It extends to the ovary, the lower part of the pistil containing ovules or seeds. Upon fertilization, the ovary becomes the fruit containing the ovule or seed. Receptacle is the part that attaches the flower to the stem or stalk. It usually lies in the middle of a sepal and is separated from the stem when fruit is picked. It has a cuplike appearance and is the point where a new flower forms first. Peduncle is the flower stem or stalk. It holds and supports the flower upright and helps it receive essential nutrients and moisture from the roots.